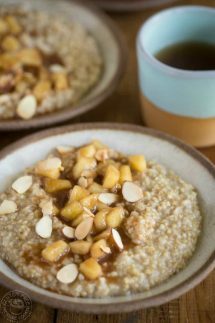 My recipe for Pressure Cooker Steel Cut Oats with Apple Pie Topping is a fun easy breakfast the whole family will love! 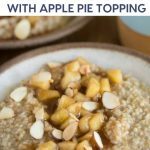 It’s a breeze to make Instant Pot steel cut oats and you’ll really enjoy this quick and easy apple pie topping that’s a great healthier alternative to simply adding sugar to your oatmeal. I used gluten free steel cut oats to make mine, but any steel cut oats will do, some readers have used rolled oats and you’ll need to reduce the cook time. Here’s a quick list of some of the items you’ll need to make this easy Pressure Cooker steel Cut Oats Recipe! You can substitute the steel cut oats for regular rolled oats, but you cannot cook the quick cooking variety in a pressure cooker. I’ve broken the recipe up into two parts, the Apple pie topping and then making the pressure cooker steel cut oats. As I mentioned above you can also use regular (not quick cook) rolled oats, I have the full cook time details on those in the recipe notes, along with the full printable recipe at the end of the post. STEP 1 – Cut up the apples just before you’re planning to use them so they don’t brown. Add them to the Instant Pot with the butter on the saute setting and stir. 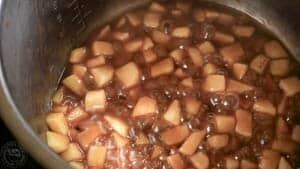 STEP 2 – Add the cinnamon, vanilla extract, and cornstarch mixed with water and stir some more, keep cooking for about five minutes until the apples are soft and the sauce has thickened, then remove the apple pie topping. STEP 3 – Clean the Instant Pot bowl and then add the gluten free steel cut oats, the sugar, and the water. Cook for the desired amount of time (see the recipe card for more details) then let the pressure drop naturally for 10 minutes or so. STEP 4 – Serve the oatmeal hot with the apple pie topping over the top and a little toasted flaked almonds or other chopped nuts of your choice, enjoy! Like this? Then you’ll LOVE these Instant Pot recipes! 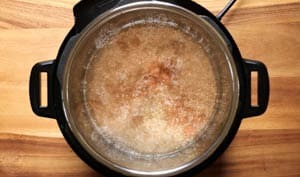 Pressure Cooker Pumpkin Pie Steel Cut Oats recipe for your Instant Pot or Electric Pressure Cooker, it’s perfect Fall food and an easy healthy gluten free oatmeal breakfast recipe cooked with brown sugar and pumpkin pie spice! Looking for an easy Pressure Cooker Pot Roast Recipe you can make in an hour? You’ll love this one as it’s naturally gluten free, made from scratch, with no canned soups or packet mixes! My Pressure Cooker Beef Bourguignon is such an easy recipe to try, I think you’ll love it, it’s a rich, easy stew that works perfectly in your Instant Pot or Pressure Cooker. 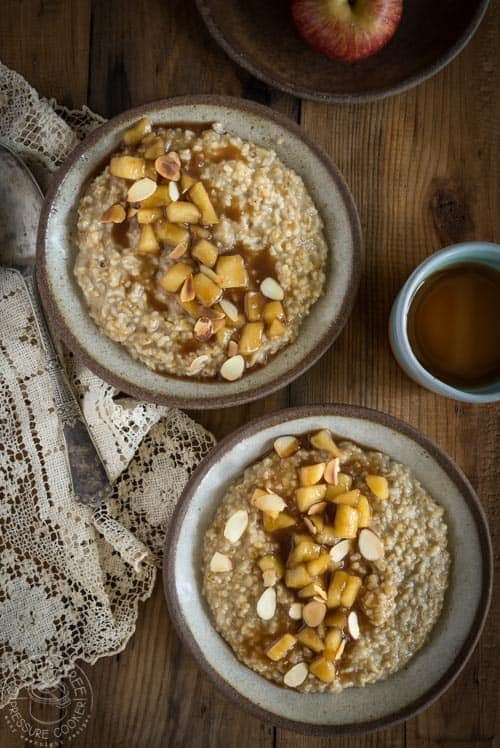 Easy and delicious Pressure Cooker Apple Pie Steel Cut Oats recipe that you can make all in one pot! Please watch my short recipe video first! it's just below the directions, then read recipe notes section before you start to cook. Turn on the 'saute' function in your Instant pot and melt the butter, or dairy free margarine. Add the chopped peeled apples and stir well in the melted butter. Add 1/2 cup brown sugar to the apples and stir again, then add the vanilla extract, cinnamon, and water mixed with cornstarch. Simmer for five to ten minutes until apples soften and the sauce thickens, add a little more water if you need to if it gets too sticky, then pour out the apple pie topping into a bowl. 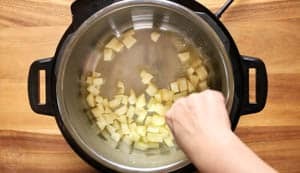 Rinse and wipe out the Instant Pot bowl. Add the gluten free steel cut oats, brown sugar, and water to your electric pressure cooker and stir well. Lock the lid, turn the steam vent to 'sealing' and using the manual setting, adjust it to cook for TEN minutes at High Pressure. When the cook time time is up, allow the unit to reduce pressure on its own without opening the steam release vent (Natural Release or 'NPR') for at least TEN minutes. After 10 minutes you can carefully and slowly release the rest of the pressure. When you open the lid you will see that the cooked oats are on the bottom of the pot and the water has separated and is on the top. This is normal, all you need to do is stir the oatmeal until the water is mixed in. I added a minimal amount of sugar to the cooked oatmeal so you will need to taste it and add more if you prefer. Top with the cooked apple pie topping and some toasted flaked almonds. Optional - pour a little half and half around the edges of the bowl of hot oatmeal when serving. COOK TIME - if you like chewy slightly crunchy oats, you can cook them for FIVE minutes with a 10 minute natural pressure release. If you like them soft but with a little bit of texture (as shown in the video and photos) use the TEN minute cook time as listed in the recipe. And if you want them really, really, soft then try cooking for FIFTEEN minutes, with a 10 minute natural pressure release. You may need to experiment a little bit to find the perfect cook time for the texture you prefer. ROLLED OATS - I have not tested this recipe with rolled oats so I can't say for sure how long they will take, but I would use the same method listed in the recipe and cook them for no more than 3-5 minutes, with a natural release as described. I think they will not need as much water as steel cut oats, so I would try 2-2.5 cups of water instead of 3. Thanks for the recipe. I’m just wondering what the benefits are for cooking in the IP versus stove? I’m new to the IP. Thank you. Did you click the link in the post to join our FB group? You might get a lot of your IP questions answered there, we’d love to have you! For me it’s often that the IP is more convenient than the stove or the oven, and it’s usually quicker (but not always). So for the steel cut oats for example, it will take a total of about 30 minutes to pressure cook as there is the time it takes for it to heat up and come to pressure (about 7-10 mins for this recipe) then the time at pressure – about another 10 mins or so, depends how you like the oatmeal cooked, then you need to wait another 10 minutes to let the pressure drop. But, the big advantage for me is that I can put it all in there, program the time in and walk away and go get the kids ready for school and know that the oatmeal will be perfectly cooked and warm when I come back, and I don’t need to watch it like I do on the stove.